On Thursday, September 28, 2017, three events signalled a shift in gear in the march towards the 2019 presidential election. The Independent National Electoral Commission (INEC) announced that Saturday February 16, 2019, would be the date for the Presidential and National Assembly elections in Nigeria. On the same day, Governor Ayodele Fayose of Ekiti State officially declared his intention to contest the 2019 presidential election, in what could be described as a controversial early play serving a foretaste of the kind of intrigue that high-level political drama in Nigeria has come to be known. The arrest of two top officials of the Ekiti State government also happened on same day. Following Fayose’s declaration for president, the Economic and Financial Crimes Commission (EFCC) arrested the state’s Commissioner for Finance, Toyin Ojo, and Accountant General, Yemisi Owolabi. This move seemed too much of a coincidence, sparking widespread reaction linking it to the presidency’s attempt at scuttling Fayose’s presidential bid, an all-too-familiar storyline in a country where historically, incumbent presidents have used the instrumentality of state to their great political advantage and at the expense of their opponents. Fayose was also unsurprisingly very quick to link the arrest entirely to his presidential bid, a move akin to the usual strategy of playing the victim deployed by politicians in a bid to garner public sympathy especially when accused of corruption. As the build-up to the 2019 elections gathers steam, strategic positioning and re-positioning is already taking place. Political parties and politicians are engaged in varying levels of rebranding where necessary, consolidating on old and still-valuable relationships, building new networks comprising high-value political assets, as well as investing resources into mending fences with now-estranged erstwhile partners. While this horse trading is fast shaping the political landscape, some names are being thrown up as the likely frontliners in the much-anticipated 2019 presidential election. Although the field is understandably still hazy, indicators from within political power-broking circles suggest growing sizeable coalescence around some key personages likely to benefit from the political capital of select power blocs for the forthcoming election. We look at the likely top contenders, the visible but with unlikely viable candidacies dubbed ‘Pretenders’, as well as attempt to throw up possibilities within different scenarios that could alter the trajectory of events. The top contenders are drawn from Nigeria’s two major political parties – All Progressives Congress (APC) and Peoples Democratic Party (PDP) –for good reason. As the political structure is presently configured, both parties offer the most viable platforms to mount any meaningful charge for the presidency, and unfolding developments around the personalities being touted provide added justification for this. There has been much hue and cry around the current president’s capacity to continue in office due to his undisclosed protracted illness warranting repeated medical trips to London. Many have argued that it is only reasonable for him to resign or just see out his first term without even contemplating participating in the 2019 election. But President Buhari remains the number one contender for the office of president come 2019, and it will be somewhat presumptuous and even politically naïve to not at least factor in the possibility of his seeking reelection. It is important to remember that despite repeated defeat at the polls, the retired general persisted for over a decade, election after election, until he won, aged 72, in 2015. This speaks to the depth of his ambition and longing to rule. Now that he has achieved the much-coveted office from diligent and trying longsuffering, will it be inconceivable if he decides to pursue his much-vaunted conviction-driven mission to completion? On the evidence of the reality where the 74-year-old ailing president defiantly rebuffed calls for his resignation despite being on foreign soil for an unprecedented stretch of time totaling over two months for medical treatment, one can interpret this as added proof of his consistent obstinacy regarding his political ambitions. More so, President Buhari’s candidacy is important on many levels. Firstly, he is seen by many in the north as the best chance for the unbroken 8-year rule of a northerner, especially with the divisive Jonathan contests of 2010 and 2015 following the death of Umaru Yar’Adua still fresh on their minds. Also, given the fact that Buhari enjoys the power of incumbency, a defining political capital especially in Africa, many advocates of the northern agenda, as well as many APC supporters believe that the party’s fortunes may be best served by his contesting. Therefore, should Buhari decide to run, he will understandably be deemed favourite. However, many, including some of Buhari’s supporters, have argued that the Buhari of the moment is not the same as candidate Buhari of 2015; they believe he has lost much political capital and goodwill owing largely to the dire economic situation as well as perceived marginalization of other tribes by his government. So, it is not clear how the believed shift in fortunes will affect Buhari’s chances at the polls in 2019 if he runs. Others argue though that despite his reduced appeal, his chances will depend more on the alternatives. And with the pool of candidates being mooted as likely challengers, Buhari’s largely unchanged lofty stature in the North coupled with his party’s still-compact North-South West alliance may put him ahead of them. But all of this might not matter if Buhari, against his stubborn persistence, is bogged down by ill-health so much so that he cannot run. There is a great chance that this might happen. Though his actual health condition has not been made public, what is certain is that it is very serious to have kept him away from office and the country for that stretch of time. Since Buhari’s return from his long London medical vacation, he has appeared more fit and strong. Some of his ardent supporters who had been quite subdued in their wish for a Buhari second-term appear to have found their voice. Several APC leaders, chief amongst whom is Governor Nasir El-Rufai of Kaduna State, as well as the leadership of a number of state chapters of the APC have already endorsed him for the 2019 election. A strong case can be made that a non-Buhari on the scene will present a more level field of arguably politically comparable aspirants. In such a scenario, a situation is likely to arise whereby primaries, especially within the APC, will be hotly contested, requiring major realignments and high-level machinations to arrive at a candidate, and not without fatal fallouts. It is this once-remote possibility, now appearing more likely by the day with repeated episodes within Buhari’s health saga, that provides the latitude for permutating on alternate prospects within the APC. Vice-President Yemi Osinbajo seems to have garnered widespread goodwill for his different approach to governance compared to Buhari’s especially during the lengthy period he acted in his stead. Many have lauded his more subtle and accommodating approach which they believe is more suited for a country with deep ethno-religious differences. Others have pointed to his intellectual and professional standing as a rare and much-needed quality for a Nigerian president. These have led some to call for Buhari’s replacement with Osinbajo, noting that he would be a much-better option especially at a time when the country was in need of healing from the accentuation of its fault lines. Others simply believe that the Jonathan situation would likely repeat itself should Buhari step out of the scene. The calculations of those who believe that Osinbajo is a top contender in 2019 might not be far-fetched. Given the central place of the South West power bloc in the national political equation, Osinbajo’s proven salability, and the widespread goodwill he enjoys in the country, which all make him a safe bet for the APC, he stands a good chance as a top contender for 2019. However, a major hurdle would be his ethnicity. Many northerners have vowed not to allow a repeat of the Jonathan situation should Buhari not complete his term or run for a second term. But considering how powerful the office of president is, if Osinbajo completes Buhari’s tenure, he would have built up much political capital and be in a position to wield far-reaching influence so as to upset the apple cart and contest, if not go ahead to win, the election. If Jonathan could do it, garnering some notable northern endorsements in the process, why not Osinbajo! The former Lagos State governor and foremost power-broker is considered by some as another top contender to watch out for. Tinubu has not hidden his desire to someday contest for president and was said to have aggressively pushed to be Buhari’s running mate for the 2015 election, a move that was said to have ultimately failed because of their shared religious faith. In one of the 2015 campaign rallies, Tinubu even publicly stated that he was more than competent to contest for president and that nothing stood in his way should he opt for it. Recently, Tinubu stoked much controversy when he suggested that should Buhari be out of the picture, he might likely consider a run for the coveted office. Some have argued that the likely reason for his not having run so far might be his much-acknowledged pragmatism and strategic approach to politics. He does not invest his political capital and economic resources without a real promise of victory! In Nigeria’s modern political history, perhaps no single Nigerian has had more impact on the political scene than Tinubu. He has been a force that for long dominated the politics and governance of the South West region before spearheading the opposition’s unprecedented capture of the centre through strategic alliance. Tinubu has been described by many as one of the most intelligent, pragmatic and strategic politicians of this era, using his art of spotting talent, building coalitions, and entrenching political succession to full advantage. From being the sole representative of the opposition in Nigeria’s democracy in 1999 as governor of Lagos State on the platform of the Alliance for Democracy (AD), Tinubu challenged the dominant PDP in the region and the country with its potent federal might, and led a movement that swept the opposition to power in the entire South West and beyond. Some have even compared his political influence to the great Obafemi Owolowo’s, with others suggesting that he might even be more influential since he has appeared more pragmatic and thus more willing to forge alliances across great divides, a disposition that saw him successfully move his power bloc to the centre. But it is not all positive for Tinubu. He suffers from serious reputation damage. Many consider him a self-serving godfather who has grown stupendously rich from fixing godsons in choice political positions. Whether proven or not, the perception is widely held and it persists. And in politics, perception is reality. That Tinubu is domineering and overbearing in making sure his favourite candidates get their choice positions is not hidden. This is seen as a huge baggage by many. That he has had cause to fallout with many big personalities over clash of interests in the past and even at present at both national and state level, is testament to this. Many believe it will be difficult for him to convince anyone of his trustworthiness in terms of accommodating multiple interests should he decide to run. He is a dreaded possibility. Considering the zoning policy of the APC which currently favours the north, Tinubu’s ambition may be a long shot. Even if Buhari does not run, another northern candidate will be favoured. Surely Tinubu, the master pragmatist, will understand why this calculation makes sense for the party’s stability and enduring future. The strain in relationship between Tinubu, his party’s leadership, and some forces at the APC-led federal government, is sure to pose a major challenge to a potential candidacy. Tinubu had openly called for the resignation of the party’s chairman, John Odigie-Oyegun, and even challenged the president’s claim to the title of ‘National Leader’, in what was interpreted as a brazen display of unbridled audacity, re-awaking fears of his huge ego and sense of entitlement that serve as warning signs against possibly granting him access to the most powerful office in the land. Tinubu’s prospects and drawbacks transcend the bounds of the APC. He is the politician the opposition and its supporters love to hate; the sole embodiment of their worst imaginations. He represents everything they consider evil across the divide, and should he emerge the APC’s flagbearer or even be schemed out and seeks alliance with the opposition, he may not find much love there. But then again, this is politics where there are no permanent friends! All said and done, Tinubu is Tinubu; he will tread where others fear to, and rock the boat where his interests are at stake, but hardly without an overarching strategy or reasonable restraint when it matters most. It will be the same with 2019. Serial contestant and former vice president, Atiku Abubakar, is another top contender. He is seen by many as desperately in pursuit of his strongly held ambition of becoming president. And considering that he will be 73 years in 2019, this presents his last, and expectedly, most aggressive push yet. Perhaps a clear proof of the level of Atiku and his supporters’ commitment to his 2019 project is the recent declaration of support for his presidential ambition by Aisha Alhassan, the serving Minister of Women’s Affairs in the Buhari administration. This bold and fearless declaration for a potential rival was quite unprecedented. It understandably generated much controversy and spurred calls for Alhassan’s resignation or sack. But maybe the most important message from the incident is the depth of the loyalty Atiku enjoys from his political supporters, as well as the extent of his disruptive strategy. Atiku had quickly seized the moment of the controversy to voice his displeasure against the Buhari administration and the APC leadership for what he considered betrayal and disregard, claiming he was sidelined following their emergence to power on the back of his generous support. Atiku is no stranger to most Nigerians; he is one personage that splits opinion especially over his controversial time as vice president that saw him battle his boss, former president Olusegun Obasanjo, culminating in lengthy legal battles and messy public spat. Atiku does not appear to have recovered from the damage to his reputation arising from the multi-front attack he suffered. When many look at him, they see only the corrupt, power-hungry, and disloyal image created by the massive assault on his personality. Others have however argued that he was only a victim of trumped-up charges from an ego-bruised boss and his unleashed hirelings. Atiku has been unrelenting in his defence of himself, using every opportunity he finds to attempt to reshape the narrative and rebrand his image. He had even tried to stop the rot from source by going to reconcile with Obasanjo with little success. Some people have argued that Atiku is perhaps the most prepared and organized frontline presidential aspirant in Nigeria in a while. They point to his well-oiled and coordinated media machine, his detailed policy proposals, his star-studded advisory committees, and his sustained relevance in the socio-political landscape owing to timely and insightful contributions to unfolding developments. A case in hand is his publicly touted progressive stand on the restructuring debate, even going as far as shaming his party, region, and other political elites for either being hypocritical or cowardly in their approach to it. What many can agree on is that Atiku will contest in 2019. Whether on the platform of the APC or the PDP, or on some other platform, all the signs point to a last and all-out push for the presidency. Given the stakes, a major factor that will determine his platform of choice this time more than ever, is the likelihood of ultimate success. The APC presents a tricky situation. Should Buhari be available to contest in 2019, the platform will be unavailable to anyone else, locking Atiku out. But if Buhari is not in the picture, he will be able to stake his claim but not without resistance from internal forces that have long been in opposition to his candidacy, represented on the one hand by his number one public enemy – Governor Nasir El-Rufai of Kaduna State— and on the other hand by the Tinubu power bloc with whom he has endured strained relations after a collaboration gone bad. But this is politics and realignments are the norm; Atiku might well rebuild old alliances and forge new ones to mount a successful charge for the party’s ticket. Should he lose out on the APC ticket, there are signs that the PDP offers a promising alternative. Atiku has only recently been courted by the Adamawa State chapter of the PDP, in a move many interpreted as a high-level orchestrated effort to pave the way for his imminent return. But this will not be so straightforward. The new power-brokers in the PDP who stuck with the party throughout its trying period may consider Atiku a usurper. Therefore, they might shut him out and be more favourably disposed to more loyal party men. But the question of viability of a candidate may sway them towards Atiku, as he is quite familiar with the rigours of competitive presidential forays, and is quite the experienced politician with a national structure. However this plays out, Atiku is likely to contest regardless of the platform; he is believed to be that desperate. As far as his chances go, what can be concluded is that he is an old horse that knows the way but one still missing an essential dimension to burst through the gates! Controversial former minister of the Federal Capital Territory (FCT) and current Governor of Kaduna State, Nasir El-Rufai, is another person being pointed to as a likely replacement to Buhari should he not contest in 2019. This suggestion is not out of place. Since joining the APC, he has grown to become one of the favourites of the party’s establishment, while also succeeding in working his way into the president’s good graces. It is little surprise therefore that the party’s leadership has appeared to side with him in his long-drawn battle with Shehu Sani, a senator from his state. El-Rufai’s choice to lead the APC’s high-profile restructuring committee may yet be another indicator of the goodwill he enjoys from the party’s leadership. El-Rufai’s ambition to become president has been long-known. In fact, he as much as admitted interest in the position in the dying days of Obasanjo’s reign. Some have even argued that the reason he may not have gone for the position in 2015, and opting for governorship instead, was because of Buhari whom he considered worthy of the candidacy and for whom he appears to have some new-found loyalty and reverence after his anti-Buhari hatchet man days in the Obasanjo era. Only recently, following Alhassan’s declaration of support for Atiku, El-Rufai was quick to declare support for Buhari as the only candidate that will be backed by him and some others, stating that they were loyalty to the Buhari ideology first and foremost, before party or any other affiliation. This underscored the depth of his support for Buhari. But if Buhari were to be out of the 2019 equation, many believe El-Rufai will be one of the favourites of the party’s leadership. Being a high-profile Northerner with arguably respectable credentials as a technocrat and administrator, especially on the evidence of his time as FCT minister, his choice may not be too difficult. However, as has been widely evidenced, El-Rufai is a divisive and polarizing figure. He is not one to steer clear of controversy, even controversy around Nigeria’s fault lines of religion and ethnicity. He ignited widespread furore years ago when he suggested violent Fulani reprisal attacks. It is this aspect of El-Rufai which limits his national appeal that may be the greatest factor working against his candidacy. But this is not all; El-Rufai is also considered by some as an arrogant, loose-talking pontificator with whom reliable political alliances can hardly be forged. This will likely prevent even some northern interest groups within his party from backing him. Some point to his bare-it-all book, ‘The Accidental Public Servant’, as an extended evidence of this, revealing his aversion to loyalty and uncanny ability to recollect and publicize verbatim, details of private conversations shared in trust. Some have argued that another strong motivation for El-Rufai is Atiku. It is believed that he will do all in his power to prevent Atiku from clinching his party’s ticket. So should Buhari not run, he might likely find his best strategy of stopping his number one political foe, whom he only recently dismissed as a political opportunist for his popular stance on restructuring, to be actually running against him. Whether or not he will win the party’s ticket and eventually triumph at the general polls will depend on a number of the other deciding factors of weak major opposition candidate, scorecard as governor, substantial widespread appeal, solid strategic alliances, instrumentality of state, and national mood, working in his favour. The former governor of Kwara State and current Senate President is one man who wears his ambition like a toga. Saraki had defied his late power-broker father, Abubakar Olusola Saraki, all but destroying his political structure in Kwara State in order to achieve his political ends. He also recently opposed his party’s leadership against all odds to emerge senate president and has remained defiant against rising threats to his ambitions. Many point to some of his now-consistent carefully crafted and strategically projected populist positions like on the ‘Open NASS’ demand, age reduction for political offices, affirmative action for women, his swift cancellation of pension from Kwara State government following controversy, and downsizing of his legislative staff, as signs of his trying to build sufficient political capital to run for president. Should Buhari not run, Saraki being a northerner (geographically speaking), may likely fancy his chances, and being the brutal dealmaker he is, move to forge alliances, even with strange bedfellows, to achieve his goal. And with his recent legal victory over corruption charges, Saraki will consider himself without much baggage to fly his party’s flag. But he still has reputation challenges to contend with, as legal victories do not necessarily fix reputation damages. Also, the strained relations he currently endures with his party leadership and some powerful blocs within his party owing to his earlier defiance and forging of alliance with members of the PDP, will likely constitute a serious barrier to his ambitions. Saraki, being ever-so ambitious, will likely not be deterred by the odds. He will calculate and push, hoping to scale the hurdles within his party and bet on his broad network extending into the opposition’s base to carry him to victory in the national election. His triumph at both levels will not come easy as alongside the other noted odds, his being of Yoruba extraction will make it extremely difficult for many in the core north to accept his candidacy as a legitimate continuation of the northern term. Former governor of Jigawa State, Suleiman Lamido, has long been considered the number one favourite for the presidential ticket of the PDP. Widely popular in the party and sections of the north, he is considered the top choice for the party, having zoned the ticket to the north. Lamido’s continued stay in the party and consistent vocal criticism of the APC have also attracted much praise from party supporters. But Lamido’s once-considered unassailable prospects anchored on his popularity, political influence and widespread appeal within the party establishment and followership, have been dealt a significant blow by the continuing corruption trial of he and his sons. Even though he and some of his supporters have dismissed the charges as politically motivated, calculated to scuttle his presidential ambitions as one deemed a formidable threat to the APC, the lingering trial has been withering his appeal and standing among Nigerians. And the longer this continues without a resolution in his favour, his viability may be significantly undermined. Lamido has been quite forward on his desire to run for president. He has expressly stated this and challenged the APC to a competitive duel he is so confident of winning. His decisiveness has been praised by some as a sure sign of his readiness and a reflection of the backing he enjoys from party leaders and power blocs. Lamido’s chances within the PDP as things stand are still fairly good. But to coast home, he will have to hope for weaker opponents, as well as favourable legal outcome in his corruption trial. He will have to be aware that the party, being conscious of its battered image in the public owing to now-public shocking revelations of corruption and still-unfolding details of corruption scandals from its recently ended national reign, will be careful not to reinforce the dark narrative by fielding a questionable candidate. In the wider field, Lamido may pose a significant threat to a Buhari’s chances, taking a sizeable chunk of the North West votes as well as the wider north’s, while also leveraging on his party’s structure in the South East and South South to bolster his chances at winning. With a non-Buhari challenger, his chances will likely even become better. He would be competing on a more level field with seemingly political equals. But this will not be so straightforward; the power of incumbency will still be at play, while internal struggles within the PDP as well as how the party plays its hand and is perceived by the public, will also significantly affect Lamido’s chances should he emerge the flagbearer. Former speaker of the House of Representatives, and current Governor of Sokoto State, Aminu Tambuwal, is another person that is being mooted as a likely replacement for Buhari should he not be available for the 2019 election. A widely appealing candidate with strong backing from the party’s establishment having contributed significantly to the party’s triumph at the 2015 polls through his instrumental defection from the PDP, Tambuwal is a serious contender. As speaker, he was able to build strong alliances across the divide, while also presenting himself as a well-read and politically astute leader. Currently, many have pointed to his management of Sokoto State as exemplary. But Tambuwal’s rebuffal of the Tinubu-backed South West agenda during the hotly contested speakership election, having sided with the current speaker, Yakubu Dogara, against the party-sanctioned choice of Femi Gbajabiamila, may have inflicted a political wound likely to be repaid in full when the time comes. Tambuwal’s chances may depend on his ability to outwit other contestants in the primary, while also leveraging on his surviving ties with the PDP and its extended power structures to mount a credible general election charge. The former Accountant-General of the Federation and current Governor of Gombe State has been quietly mooted as a great choice for the PDP. Dankwambo is widely viewed as a respected technocrat with little to no political baggage. He is also said to have been a silent achiever in Gombe State. What will most likely work for Dankwambo when the political calculations are being done, will be the fact that he will represent a breath of fresh air for a party that has for far too long been associated with scandal-ridden candidates. He will likely signal a shift in the party’s usual offerings. But this shift may appear too soon for a party still defined by an order of deeply entrenched powerful interests, and Dankwambo being without a recognizable power bloc behind him, may be a far-fetched option in the power equation. Dankwambo’s candidacy, as some have argued, combine the qualities that might pose a serious threat to whatever option the APC presents, except for its limited stature. The former Kano State Governor and serving senator is one man whose ambition to become president is not hidden. During the APC primary prior to the 2015 elections, he posed the most serious threat to Buhari’s emergence, defeating the likes of Atiku Abubakar and coming second. His kwankwasiyya movement has attracted lots of supporters, sending a signal that he might be attracting a groundswell of support from the northern political base for another serious presidential run. But the fact that Kwankwaso has somewhat fallen out with his party’s establishment and is also battling corruption allegations may have seriously damaged his chances. It was recently reported that he was close to returning to the PDP owing to disaffection towards the APC. If Buhari does not run, Kwankwaso will consider himself able to compete seriously against any other opponent, but opposition from his party’s leadership and likely rejection from his former party (PDP) which he dealt a serious blow through his defection at a crucial time, may condemn his otherwise potent candidacy to defeat. There are some names that have been thrown up but whose candidacies might not be considered viable, given the prevailing context. These persons’ declared or suggested interest may be merely a front for some other candidate or an attempt to bargain to be considered as running mate, or just for future purposes. The Governor of Imo State is one person that has been seen to be perpetually running to be president, regardless of his other endeavours. He is considered to be ever-positioning himself to mount a serious and hopefully successful presidential run. It is no surprise that his name has cropped up as a likely contestant in the 2019 election, especially as his governorship tenure will be over by then. But whatever his qualities and political capital are, the fact that the party has zoned the position to the North will likely prevent his run or, if he runs, his success. Even if Buhari does not run and there appears an opening for a non-northerner, acting president Yemi Osinbajo may stand a better chance. But it is possible that Okorocha is only priming himself for 2023 when it is believed the position will be zoned to the South East. Well, if he could contest in the last APC primary despite being zoned to the north, what would stop him in the coming primary? The controversial Governor of Ekiti State has consistently been in the news mostly for his virulent attacks on Buhari and the APC. Some PDP supporters, proud of his strong opposition and loyalty to the party at a time the party was battling serious challenges, have expressed hope that he would run for president come 2019. As if to grant their wish, Fayose launched his 2019 presidential campaign on facebook, to widely jocular reception. He followed up that social media launch with an actual launch recently. And although PDP leaders quickly dismissed his move as a waste of time because it was against the party’s existing zoning policy, Fayose has continued to insist on his right to contest, true to his reputation as an obstinate disruptor. Many believe that Fayose is a powerful force within the party as an influential governor whose bloc of the party recently received added boost with the Supreme Court ruling affirming their candidate’s leadership. They however reckon that this will not lead to any serious presidential bid as the party had zoned the position to the north. Some argue that he may just be angling to be considered as running mate, a suggestion that was rankly rejected by a group within the party recently, instead preferring the former Ondo State governor, Olusegun Mimiko. There are some unknown factors that may well swing the fortunes of the candidates one way or the other. Will Buhari contest? So much depends on this question. In fact, it is maybe the most significant question in the 2019 permutations. If Buhari’s health does not permit him to contest, we will be looking at a likely highly competitive race, featuring many of the identified top contenders and more. 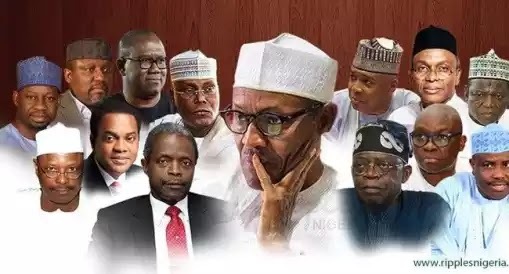 But if Buhari contests, almost all of the top contenders from the APC might likely suspend their ambitions, and the chances of the PDP may be slimmer especially regarding securing substantial northern votes. Right now, nobody can say for sure if he will be available for 2019 elections. Will there be a new credible mega party forged by disaffected members of either or both the major parties? This is likely but still unknown. Should this happen, depending on the party affected most, it can sway the election either way or create a better path to victory for the new party. Independent Candidacy: Peter Obi, Donald Duke? If the recent constitutional amendment okaying independent candidacy eventually becomes law, it might introduce an added dimension to the mix. Top contenders who fail to secure their party’s ticket or any other major party’s ticket may deploy their political structure and run as independent candidates. Depending on the party affected the most by the defection, significant amounts of votes might be lost, impacting the party’s overall chances. This can sway an election, especially a close election. Some have suggested the likes of Peter Obi and Donald Duke, who enjoy favourable appeal among wide sections of the country, as likely personages that can give real force to independent candidacy and make it truly competitive. Peter Obi has been quite visible and vocal since leaving office as governor of Anambra State. He has been guest at different notable events where he had made widely acceptable proposals drawn from his experience as governor considered insightful and practical, making many to suggest he run for president. Some have even interpreted his public appearances with their associated considered thoughts as his calculated attempt at strategic positioning for a possible presidential run. Although he has not come out to confirm these suggestions, his growing intentional incursion into key national debates, and within the limelight, may lend credence to the suspicions. Since it is widely believed that the two current major political parties will likely zone the presidency to the South East in 2023, some suggest Peter Obi is just testing the waters with 2023 in his sights. At the moment, he appears a man without a party. Some have suggested that he is considering joining the ruling APC. No one can say for sure where he belongs at the moment. His ties to APGA seems all but strained while both the APC and PDP appear remotely possible options for now. But neither will be easy. Already existing power blocs and entrenched interests may constitute real barriers to a recent entrant’s chances. But this might depend on when he joins. If his target election is 2019, he might already be too late for either party whose calculation in any case does not factor in a South East candidate as head of the ticket. If he opts for 2023, there is still time to make his case, build strong alliances, and mount a credible challenge. As running mate, there may yet still exist a chance for 2019 in either party, but quite a remote possibility. For Donald Duke, since his failed presidential bid in 2007, he has somewhat remained in the background in the political scheme of things, but certainly not in the hearts and minds of many a Nigerian. He is one personality who enjoys favourable disposition from lots of people largely owing to what some describe as progressive ideas evidenced by his time as governor of Cross River State highlighted by the Tinapa project, his seemingly refined and cultured approach to politics, and of course his looks. On his part, he has not shown much desire or interest to revive his presidential ambition, likely because of the realization that it might have suffered a fatal blow due to the emergence of Goodluck Jonathan as president, a development believed to have settled the South-South presidential question for the foreseeable future; but this is politics where dreams are oddly reawakened and where risk-taking is common! He might ride the wave of his public appeal and broad support to shake things up in the presidential race in 2019 or even 2023. Since the zoning policies of the major parties will not favour his candidacy, independent candidacy may just be the ideal platform for such an audacious move. How far this will go in landing him in Aso Rock is another question altogether. It will require one of the grandest inexplicable collusion of circumstances for this to materialize; but in politics, you never say never! The growing secessionist calls in the South-East and the South West, the controversial military operation against the now-proscribed Nnamdi Kanu-led Indigenous People of Biafra (IPOB) in Abia State, as well as the on-again-off-again vacation orders issued in the North and the South-South regions of the country, have all contributed in no small measure to heating up the polity and one cannot say how things will end. Will there even be a single country by 2019? Will election even hold? If there is a single country and election holds, who will the atmosphere and mood of the country favour? The answers to these questions hold great implications for the whole competition for 2019. Is it possible that should the age reduction amendment become law that a young charismatic candidate will disrupt electoral permutations, garnering the majority of youth support, and sweep to power? Will this happen? This might be a remote possibility given deeply-ingrained political structural issues like lopsided, elite-focused, old-power bloc-benefiting campaign finance, electoral system hinged on broad national political structure, and flawed electoral process. But it is still an unknown that should not discarded.